On August 11, 2011, I posted about pre-1940 steam engine powered oat threshing. On August 12, Bill, Jackson (Bill’s and my grandson, pictured above) and I attended the Albert City, Iowa, Threshermen and Collectors Show. Threshing of wheat — not oats — was demonstrated there. All three of us enjoyed the demonstrations involving machinery and horses, talking with those demonstrating, the parade of implements, and the ice cream. The 5-minute video below is from one of the August 12 demonstrations. It is of shocked wheat and a threshing machine powered by a steam engine, similar to my Great-Uncle Art’s oat threshing rig. In a subsequent post, I’ll include a short video of horsepower driven (as opposed to steam engine driven) threshing. This entry was posted on September 8, 2011 at 10:57 pm and is filed under Uncategorized. You can follow any responses to this entry through the RSS 2.0 feed. You can skip to the end and leave a response. Pinging is currently not allowed. “For thousands of years, grain was separated by hand with flails, and was very laborious and time consuming. Mechanization of this process took much of the drudgery out of farm labour” (also from Wiki). I LOVE what you wrote, Peggy. For more of an understanding about threshing and especially what you wrote about how it would have been the type of “field trip” with Jackson that Grandpa Deane would have loved. That line of thought had entered my mind, too, but I love that you thought the same thing. As in, fun that I wasn’t the only one who thought it. During the same trip to Iowa, Bill and I made sure that Jackson went out into the bean field to inspect the crop. We also went into Daddy’s shop. In my mind, all three experiences (threshing, field inspection and shop) had “Daddy” written all over them. I too think it’s really great that Jackson goes on “field trips” which involved learning about farming and his family’s heritage connected to farming, Louise. We go to church in Albert City, where the men who started the Thresherman’s Show also attend. 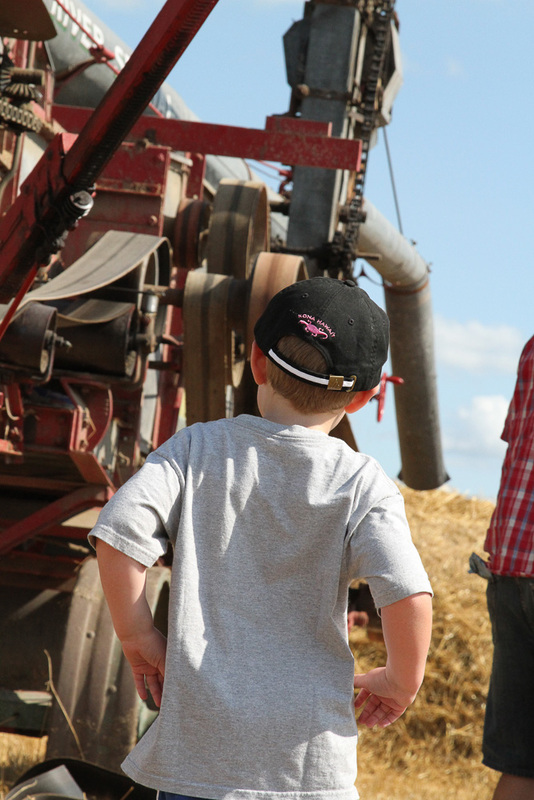 It started out as a few dads wanting their kids to know about “the olden days” and how farming used to be done. The event has obviously grown, with thousands attending now. These guys, their sons, and their grandkids, wives and daughters all help make it the bigt event it is….as well as so many others. Gus and Kara were there this year, helping the youth group in one of the concession stands. We haven’t gone for many years, but need to get Phil back over to it next year. Gus remembers playing in an old threshing machine in the grove as a kid. He says you could climb up into the machine and play inside. Yikes! Wonder if his mom knew? There was still a threshing machine in a shed when we came to the farm. Phil gave it to someone, possibly the Weigert Farm for their show.